This day and age has changed immensely as it relates to Executive or Close Protection from that maybe 10 to 20 years ago. 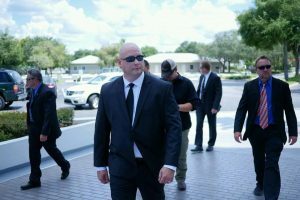 Agents or bodyguards are smarter and much more professional in contrast to the stereotypical 300 pound man with the mind and intellect of a child. Our agents have been trained and continue to train as they attempt to perfect their craft. Our agents come from vast backgrounds. Military, Law Enforcement, Government Agencies and Executive Protection schools to name a few. With this array of various backgrounds, we are able to put together teams that will fit and fulfill your specific security need. Much thought and strategy goes into what we do today rather than muscles and fists. Our teams of expert agents pay attention to every detail and leave no stone unturned, in an effort to provide you with the most protective, efficient and non intrusive security we can. Our aim is to give our clients the peace of mind they need to go about their daily activities and business. Not only will we keep you safe and protected, but we will provide this in a manner that is not detrimental to your lifestyle or way of life. We will take every precaution when it comes to protecting you, your family and your property. Our agents experience in this field is second to none. Our senior staff has over 60 years of combined experience in the Executive Protection and bodyguard industry.